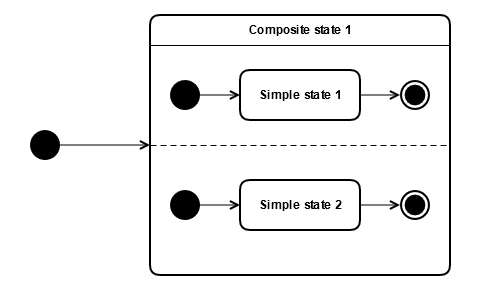 The final state is an element of a state machine. When it is reached, the containing region is completed (it satisfies the completion condition). The containing state of this region is considered completed when all contained regions are completed. A final state belongs to a region. A final state is shown as a circle surrounding a small solid filled circle. The 'Composite state 1' is entered and becomes active (via the transition emanating from the outer initial pseudostate). The states 'Simple state 1' and 'Simple state 2' are entered and become active (via the transitions emanating from the inner initial pseudostates). 'Simple state 1' and 'Simple state 2' are exited and each of the regions are finished (completed) because final states are reached. Thus 'Composite state 1' is finished as well. The 'Composite state 1' is entered and becomes active (via the transition emanating from the initial pseudostate). 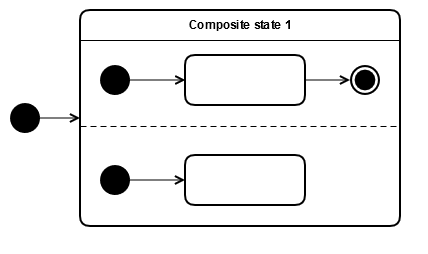 The first region of 'Composite state 1' is finished, but the second region is not. Thus 'Composite state 1' is not finished. A final state has no outgoing transitions. A final state has no regions. A final state has no behaviors (entry, exit and do). There is no interpretation of and deviation from the UML specification for a state machine's final state.